From Goodreads: Rebecca Kauffman’s tranquil Old Order Amish life is transformed when she suddenly has custody of her two teenage nieces after her “English” sister and brother-in-law are killed in an automobile accident. Instant motherhood, after years of unsuccessful attempts to conceive a child of her own, is both a joy and a heartache. Rebecca struggles to give the teenage girls the guidance they need as well as fulfill her duties to Daniel as an Amish wife. My Thoughts: A Gift of Grace was an interesting read. 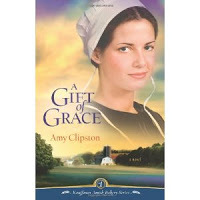 At the beginning of the book Clipston prefaces her story with the warning that just as Amish culture varies from community to community some of the language and behaviors in the book might surprise readers who are used to a specific picture of Amish life. There were a few places in this book where I had to re-read and thought to myself “did that really just happen”. This wasn’t necessarily bad but it did challenge the view that I had in my head of the ‘typical’ Amish man or woman. Above all A Gift of Grace was a sweet story about two teenage girls struggling to find their place in the world. There was definitely an underlying theme of truly listening to God and following His plan instead of one’s own. This is something that most every character struggled with at some point and it was interesting to see how each character reacted to the obstacles placed in their path. Clipston did a great job of portraying her characters for who they were. I got a sense of actually knowing them, and I found myself really becoming invested in them especially with Rebecca. Her struggles really pulled at my heart. This is the first in the Kauffman Amish Bakery Series and I am looking forward to reading the next book. I am very interested to see what happens next as A Gift of Grace closed with a bit of a cliff hanger and certainly didn’t end the way I expected it to.